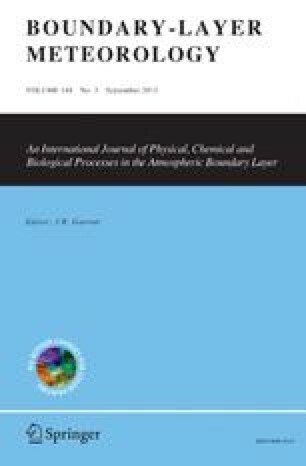 The Kolmogorov constants for CO2, wind velocity, air temperature, and humidity fluctuations were evaluated from measurements made over soybean and grain sorghum fields and found to be 0.78 ± 0.11, 0.49 ± 0.08, 0.70 ± 0.15, and 0.99 ± 0.16, respectively. These results are consistent with recent observations reported in the literature. Published as Paper No. 7255, Journal Series, Nebraska Agricultural Experiment Station. The work reported here was conducted under Regional Research Project 11-33 and Nebraska Agricultural Experiment Station Project 27-003. Associate Professor and Post Doctoral Research Associate, respectively, Center for Agricultural Meteorology and Climatology, Institute of Agriculture and Natural Resources, University of Nebraska, Lincoln, NE, U.S.A., 68583-0728.